Exploring and breaking traditional concepts of beauty, viewers are led on a journey to rediscover their own understanding of true elegance at Shanghai Fashion Weekend. Shanghai Fashion Week drew to a close with an exhibition on beauty. Exploring and breaking traditional concepts of beauty, viewers are led on a journey to rediscover their own understanding of true elegance. We pull together a few highlights of Shanghai Fashion Weekend, reveling in the creative power that was on show in these immersive installations. Humans have always admired flowers. As if to fulfil the wishes of mankind, this exhibition has immortalized blooming flowers. Ten mechanical flowers hang from the ceiling, constantly blooming and withering in the tempo of a heartbeat. Yet it begs the question: Can we capture the true beauty of a bloom or is it lost the moment we try to immortalize it? Models are decked in futuristic wear; think eye-blinding metallics, iridescent accessories and structural shapes. We first learn the meaning of beauty through nature; from mountains and lakes, flowers and forests. From the first floral totem carved on the walls of caves by our ancestors, to the floral patterns that find their way back to runways every Spring, nature has always held an inseparable role in our lives. “River of Life” attempts to translate the vast, beautiful forms of nature into fashion. Soft pastels, sweet florals, floaty fabrics and a peek of gingham sets a romantic tone. Some believe only an accurate portrayal of nature can it be true to restoring and preserving its beauty. Yet, such a reproduction of work is also arguably superficial. Whichever belief you subscribe to, the flowers peeking out of sleeves and collars of feminine dresses remain a romantic sight to take in. Does beauty have a price? Can we use wealth to buy eternal beauty? 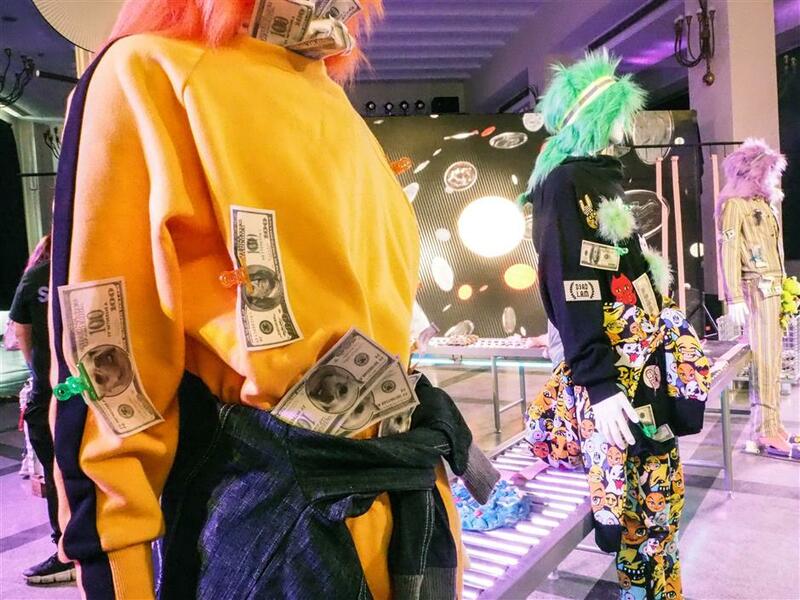 These are the questions revolving around the exhibition “Money Making Factory.” Here, dollar notes are plastered all over the mannequins; stuffed into pockets and pinned on to clothes. Metal cages filled of dollar notes are positioned beside a conveyer belt. Designer handbags and clothes used to be highly coveted, but today, the pursuit of materialism has changed its course. Facial features and hairstyles are desires that are easily attainable with wealth. Beauty and wealth have become inextricably intertwined, a phenomenon that “Money Making Factory” wishes to explore. Shanghai Fashion Weekend introduces a collection of Sesame Street apparel and accessories. Combining childhood nostalgia with standout active wear, this range of sweatshirts, varsity jackets and t-shirts may prove to be an irresistible lure for the fans. Sesame Street is a pioneering television show that premiered in 1969, with a mission to help kids everywhere grow smarter, stronger, and kinder. Shanghai Fashion Weekend’s partnering brands include Tsingtao, Beats by Dre, Evian, iDai, JD, and Nightbus. The exhibition held showroom boutiques, showcasing designers and brands such as XU ZHI, F/FFFFFF, Haizhen Wang, TIWILLTANG, lost in echo, RATPACK, botkier, and Zeeta Yang.